Every Halloween, bags of triangle-shaped, yellow, orange and white candies fill trick-or-treat bags all over the country. If you guessed “Candy Corn” as the candy, you are right. 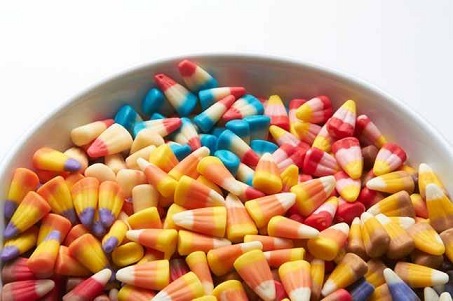 Every October 30th is “Candy Corn Day.” The candy is basically made of sugar, corn syrup, confectioners wax, artificial coloring and binders. Candy corn has been around for more than 100 years. George Renninger of the Wunderlee Candy Company invented the candy around 1880, and was originally popular among farmers. The Goelitz Candy Company started making candy corn in 1900 and still makes it today, although the name has changed to the Jelly Belly Candy Company. Most candy company’s will say candy corn is only five calories a piece and zero fat. When people see a food being described as zero fat, it has to be good for you. But the fact is, that is NOT TRUE. Corn syrup has been linked to weight gain. A recent study (June 2015) at the Beckman Institute for Advanced Science and Technology at the University of Illinois found that, matched calorie for calorie with the simple sugar glucose, fructose (Corn syrup is a fructose sugar derived from corn) causes significant weight gain, physical inactivity, and body fat deposition (Science Daily). Another study in 2011 at the Oregon Health & Science University used functional MRI images to gauge responses to fructose and sucrose alike on the brain. They used nine human volunteers, all who were of normal weight. They found in the part of the brain that controls responses to food, that there was a reaction to glucose that was opposite that of the reaction to fructose. The scientists stated that these results support previous research on animals and link fructose to obesity (Natural News). But enough of the “Bearer of Bad News.” If you eat a healthy diet every day, a little candy corn will not hurt you to enjoy it this day, National Candy Corn Day. Here are a few ways to enjoy the candy. 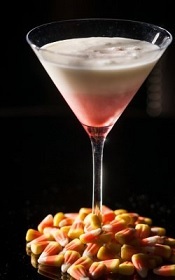 For those of you who may through an Adult Halloween Party, here is a Candy Corn Martini by Whiskey Blue in West Los Angeles. They say candy corn is a Halloween staple, and while enjoying munching on everyone’s favorite Halloween treat try sipping on this martini. Find the martini recipe by Linking Here. If you go elaborate at giving out goodies to children who arrive to your door the early evening of Halloween, then here are some great cupcake ideas using candy corn. 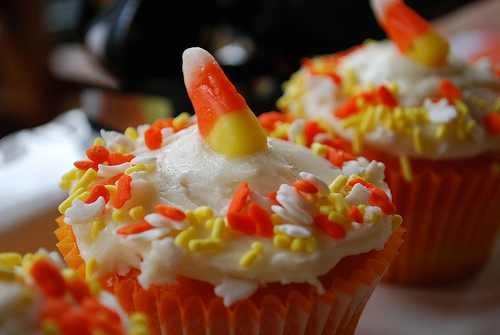 Candy Corn Cupcakes – These celebratory cupcakes by The Sugar Turntable are easy to make. Find the step-by-step instructions by Linking Here. 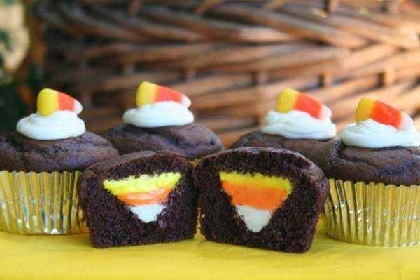 Your HomeBased Mom has a delectable recipe as well for candy corn cupcakes. She says, Candy Corn Cupcakes are sure to be the hit of any Halloween Party you have been invited to attend. Get the recipe by Linking Here. This entry was posted in National Food Days (USA), Party Favorites and tagged Add-2, Bath salts, Be Our Guest Restaurant, Candy corn, candy corn cupcakes, Candy Corn Martini, Cartwheel (gymnastics), Cookie, Corn syrup, Corned beef, Costume, fructose, Halloween, Halloween Treats, obesity, Weight gain. Bookmark the permalink.